Curoas (Koo-roo-as) means "Paid Soldiers". These southerners are an excellent heavy infantry, well able to deal with most opponents. The La Tene Celts were used as mercenaries all over Europe and Africa by the Romans, Carthaginians, other Celts, and various peoples. These men often form the core of a mercenary army, and are usually tough veterans who have seen many different campaigns and have taken pay from many different masters. They are an excellent heavy infantry, well able to deal with most opponents. They are armed with javelins and spears and use these javelins to break up an enemy formation before the charge. As with most Celts, the charge can become disorderly, but it often succeeds in breaking through the enemy line none-the-less. Their name, Curoas (Koo-roo-as) means "Paid Soldiers". 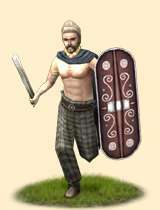 Historically, Celtic mercenaries were used all over the ancient world. Graves and artifacts have been found even into Asia. Celts were rightly famed for their ferocity in battle, as well as a number of innovations in arms and armor development. There were many Celts willing to leave their tribes and serve other masters in exchange for wealth. This made them somewhat untrustworthy, willing to flee if a battle went poorly, as they didn't fight for honor or glory, but money, and money was useless if one was dead. The La Tene Celts actually encompassed a number of sub-cultures, most notably Gaul, but also the Lugians, Belgae, most Britons, and others. This meant that in much of Europe, Celtic warriors were never far away, and so, for the wealthy general, he could have always had at least some heavy infantry on hand.